Although we strive to answer as many questions as possible here on our site, please feel free to contact us if we have not answered your specific question! What does Emport LLC do? Emport, LLC handles sales and distribution for a variety of food testing and quality control test kits including GlutenTox and AlerTox within the USA and Canada. I own a business outside of the US. Do you ship to___? Emport, LLC primarily ships to addresses within the United States of America, and our sales agents in Canada can be reached at glutentox.net. However, feel free to contact us with your requestl GlutenTox is distributed around the world and if we are unable to ship to your location we will happily connect you with the appropriate resource. Will you analyze my samples for gluten if I mail them to you? Sorry, no. Emport, LLC is not equipped to perform in-house analysis of samples, nor can we issue certifications about the gluten content of your items. We are, however, happy to suggest alternatives. Kindly contact us for more information. I want to start producing gluten-free/allergen­-free foods. Can you help? We strive to be as helpful as possible, and are happy to share resources that can be helpful in developing a safe manufacturing plan. Many of these resources can be found in our news section or on this FAQ page. However, we are not food safety consultants. Emport LLC cannot certify your products as gluten­-free or allergen­-free, assist with the creation of your HACCP, HARCP, or Allergen Control Plan, or provide third party lab testing or Certificates of Analysis for your items. GlutenTox tests are user-friendly lateral flow tests that use the G12 antibody to detect gluten contamination in foods and liquids, and on surfaces. There are GlutenTox kits for every need, from home users to commercial manufacturers. Lateral Flow Devices (or LFDs) refer to a category of test designed to detect the presence or absence of a particular substance, without the need for sophisticated lab equipment. Through capillary action, the sample is brought along the length of the test and – if the substance in question is detected – will cause a visible signal to appear. The most commonly-seen type of LFD test on the market today is the over-the-counter pregnancy test. How sensitive are the GlutenTox tests? All GlutenTox tests have a flexible LOD for food testing, and the sensitivity of each test can be set by the person performing the analysis. GlutenTox Home can be set to 5ppm or 20ppm; GlutenTox Pro can be set to 5, 10, 20, or 40ppm, and GlutenTox Sticks can be set to a variety of thresholds as low as 3ppm and as high as 100ppm. Surface testing is a qualitative yes/no result. According to the Codex Alimentarius Commission, the FDA and Health Canada, food can be considered “gluten-free” if it is made without gluten-containing ingredients and the amount of gluten present due to cross-contamination does not exceed 20 parts per million (ppm). What is the G12 antibody? The G12 antibody was created to target the 33-mer peptide of the alpha-gliadin molecule. Studies show that this peptide is the primary cause of the auto-immune response in celiac patients. This leads to a high correlation between positive test results and samples that are toxic for people with celiac disease. If a food or beverage sample contains this toxic peptide in sufficient quantity, it will trigger a positive response from GlutenTox. G12 is able to recognize gluten in wheat, barley, rye and certain strains of oat (for more on oat toxicity, see question below). It is also uniquely well-suited to detecting gluten in hydrolyzed, fermented, or otherwise processed foods. In addition, the G12 antibody shows no cross-reactivity with soy or any other gluten-free matrices. Emport is pleased to share some details from Biomedal regarding the G12 antibody, specifically developed to identify the 33-mer peptide of α- gliadin. Read more in our News post. Choosing GlutenTox: which kit is right for me? What kind of safety qualifications does GlutenTox have? Biomedal Diagnostics, the manufacturer, has numerous positive evaluations for their gluten test kits and in-house gluten testing. These include: AOAC-RI has awarded GlutenTox Pro PTM status for testing both foods and surfaces; AESAN (The Spanish Agency for Food Safety and Nutrition) has positively evaluated the GlutenTox Lateral Flow Devices as an accurate method for gluten detection in any types of food; GlutenTox Sticks have passed the FAPAS proficiency tests, an international standard based in the UK. Additionally Biomedal holds both ISO 9001 and ISO 17025 certifications for the manufacture of gluten detection devices and the in-house analysis of samples for gluten, respectively. What is the GlutenTox Reader? The GlutenTox Reader is a portable optical scanner that provides a precise, quantified analysis of PPM in a food or beverage sample. It is designed as an optional final step to the GlutenTox Sticks kit. The finished test strip is simply placed in the Reader and within seconds a quantified result is available digitally. The GlutenTox Reader cannot be used alone, or with any other test kits. Is there a GlutenTox ELISA test? Yes, there are ELISA tests in both Sandwich and Competitive formats that contain the G12 antibody. Emport, LLC does not normally stock them, but if you are interested in running ELISA tests in your lab we will happily connect you with the proper contacts. Does GlutenTox make a good science fair project? Over the years many students have enjoyed using GlutenTox to explain gluten-free foods to their classmates. If you are considering using GlutenTox as part of your project, we encourage you to contact us first so that we can offer pointers on popular experiment designs. We also have articles posted about Science Fair projects. My kit has arrived! Now what? Expiration dates are clearly printed on each kit, but are generally at least a year from the ship date. You will know if you are using a test that has expired because the blue control line will not appear. All kits can be stored at 35°F – 85°F. We do not suggest storing kits in the refrigerator, as excess moisture can damage the test strips. How should I dispose of the kit after use? All components of the kit are non-toxic and therefore fully disposable in ordinary trash. They can be recycled where appropriate according to the material. How do I test a food or beverage sample for gluten? How do I test surfaces for gluten contamination, and what do the results mean? Surface testing is possible with both GlutenTox Pro and GlutenTox Sticks kits, and results will simple and qualitative: positive indicates the presence of gluten, negative indicates the absence of gluten at a level of 10ng/cm2. Click here for instructions, or scroll up one question. The instructions for testing surfaces for gluten begin at 2:59 on the video. Does the G12 antibody recognize oat? Yes and no. G12 can of course detect cross-contamination in oats samples, whether from barley, rye, or wheat. In addition, research indicates that some strains of oat are inherently toxic for people with celiac disease and do contain gluten even when 100% pure oat. If the oat being tested is potentially harmful for celiac disease patients, a positive signal will appear. If you’d like to read more about gluten in oats, we recommend this study on gluten in oats. You can also visit Celiac.com for an analysis of the study. Are there items GlutenTox is not recommended for? Antioxidants, polyphenols, and tannins: Gluten found in matrices that are high in antioxidants, polyphenols, or tannins (for example cocoa or tea) can be difficult to extract. For this reason, it is possible that the amount of gluten present in these samples can be underestimated. If using GlutenTox Sticks, a separate polyphenol additive is available that can appropriately extract gluten from these matrices. Please note a positive result will always indicate the presence of gluten in the sample. Maggi – Seasoning – Arôme (liquid sauce): This seasoning sauce contains gluten as described by the manufacturer in its ingredients list. Note that its manufacturing process and other active ingredients are not suitable for GlutenTox Home. Consider this food as containing gluten. Soy Sauce: Naturally brewed soy sauce undergoes a fermentation process that often breaks down gluten to level close or below the detectable limit. Highly processed and complex matrices: Although GlutenTox Home and Pro tests have been successfully tested against a wide variety of highly-processed matrices, there may be some cases in which a more thorough extraction process is required to identify traces of gluten (for example, the multi-step extraction options available via GlutenTox Sticks). If you are planning to test a vitamin, supplement, medication, or other products that you feel may be highly processed, please contact us with more information about the specific item — we may recommend various modifications. In all cases, a positive test result always indicates the presence of gluten: to date no false positives have been found with G12. Items that are very high in silica: Large amounts silica can cause the extraction solution to “gel” in a way that can create challenges for the sample preparation process. These items often require special analysis in a laboratory setting. If you would like to test these items with GlutenTox, we suggest using half the amount of sample and double the number of drops as recommended in the manual. GlutenTox has been validated against some but not all personal care products. Because of the wide range of formulations and ingredients within personal care products, we recommend additional caution when testing shampoos, lotions, cosmetics, and other non-food items. While a positive result does always indicate the presence of gluten, false negatives are possible. Can I test beer for gluten? The short answer is that while you can certainly trust that any positive test results with GlutenTox are indeed positive for gluten, the possibility for false negatives is also real. All lateral flow kits for gluten face the same challenge when it comes to heavy hydrolyzation, malting, or fermenting – there is a small gray area where it’s possible for beers (or soy sauce, etc) to have their proteins broken-apart enough that they don’t register on tests, but still intact enough to possibly trigger a celiac response. Below you’ll find some information relating to gluten detection in beers, including so-called ‘gluten-removed’ beers that use enzymes to degrade the malted barley. When it comes to testing for gluten in beer, antibody-based testing is currently the gold standard. An antibody is developed that looks for specific, short chains of amino acids that are unique to gluten (ie, not cross-reactive or found in other, safe foods). These short chains are called epitopes. Lateral flow / rapid kits require two copies of the chain – two epitopes – to “catch” the gluten molecule. For the G12 antibody, the epitope is found three times on the 33-mer peptide, which is known to be highly immunotoxic. So as long as the peptide is 2/3 intact, it should be identifiable. The most common type of lab test, a Sandwich ELISA, also requires two epitopes in order to identify gluten. There is a type of ELISA called a Direct or Competitive ELISA that only requires one epitope, but very few labs are trained to do these. They’re quite delicate and have not been validated as thoroughly as Sandwich ELISAs. There are situations where a beer could have small fragments of gluten in it that are too small for rapid tests to pick up (but that a Competitive ELISA could quantify). It’s generally accepted that these beers would not be celiac-safe. There are also situations where a beer could have small fragments of gluten that are too small for even a Competitive ELISA to pick up – and there is no consensus within the communities about whether or not these beers would be celiac-safe. Can I test the oil in my deep fryer? Oil is inherently gluten-free, and the primary risk of cross-contamination comes from the gluten-containing crumbs that may be floating in the oil and could potentially adhere to otherwise gluten-free food. The recommended process for verifying that a deep fryer or fryolater is safe for use is to filter the oil and collect the crumbs and other residue that are found. Pat and/or rinse the residue to remove as much excess oil as possible, and then test the residue using GlutenTox standard procedures for crumbs or powders. If the residue produces a negative test, you can consider the oil safe for use with gluten-free items. After 10 minutes, the test showed a negative result (only the blue control line appeared). But when I checked the test strip the next day, I noticed a faint pink line. What’s going on? The test results should be read at 10 minutes (not before and not after). Any faint lines that appear after this time limit are not valid and do not indicate the presence of gluten in the sample. Conversely, positive results may fade in intensity after 10 minutes. If the test shows a pink line and a blue line at 10 minutes, it’s positive. If the test shows only a blue line at 10 minutes, it’s negative. There aren’t any easy one-size-fits-all solutions to effectively control hazard points in the manufacturing process. Minimizing hazard points and identifying best practices takes experience and expertise. Emport does have some Best Practices Guides that you might find helpful. You can download Best Practices Guides for when to test effectively and how to sample your materials. You can also reference Emport’s article Best Practices for Gluten-Free Manufacturers, which provides a fuller explanation of some of the key concepts in creating a hazard plan. I got a test result that surprises me. What do I do? If your results are unexpected, please email us with more information about your test. We’ll work with you until your questions are resolved. AlerTox Sticks kits are designed to help food manufacturers monitor levels of common allergenic proteins at every step of production and in a variety of matrices. For what allergens are AlerTox Sticks kits available? Interested in learning more about allergens and controlling in a manufacturing setting? Please refer to the articles in our collection. Yes, there are ELISA tests available on special order for all AlerTox Sticks allergens and many others including sesame, walnut, and coconut. Contact us for details. Do you have resources for building an Allergen Control Plan? Although we cannot offer help for developing your specific plan, we’ve collected some links we feel may be of interest. The FDA provides guidance documents that cover basic questions about compliance to FDA legislation. You can also check our blog for some practical applications for allergen control. What are the legal requirements for labeling my food allergen-free? Within the United States, FALCPA regulations cover the production and labeling of foods containing any of the eight currently listed major food allergens: soy, peanut, tree nut, wheat, egg, milk, crustacean/shellfish, and fish. Requirements in Canada can be found on Health Canada’s Food Allergen Labeling page. FARE, or Food Allergy Research and Education, also has detailed guidance documents for manufacturers of allergen-free foods. Will I need any special equipment to run AlerTox tests? Usually no, but some kits do require cotton swabs or cotton balls for surface testing. How long does it take to run an AlerTox Sticks test? Test results are available in less than 12 minutes. What are AlerTox's limits of detection? Each AlerTox Sticks test kit has a slightly different LOD, but most can detect a minimum amount of allergen ranging from 1-10 ppm. Does AlerTox Sticks hold any third-party validations? AlerTox Sticks kits do not hold any external validation. However, no regulating body has established validations for any testing procedure for the allergens addressed by the suite of AlerTox Sticks kits. Please contact us if you are interested in receiving the validation reports. What is the hook effect? The kits are designed to detect traces of allergen, and therefore samples that are very high in allergenic proteins (eg more than 5,000-10,000 ppm) may incur a false negative in the form of a hook effect. Matrices that contain a very high amount of the allergen can override the test. If you suspect this to be the case, an option is to dilute the sample (1 part sample to 3 parts water, for example) and re-test. You can always contact us with questions. Can AlerTox Sticks kits detect allergens in fermented or hydrolyzed food? Lateral flow kits like AlerTox can have trouble with foods that have been fermented, hydrolyzed, malted, cured or otherwise very highly processed to the point where their proteins start to break down. The antibody in the test kit is looking for a very small sequence of amino acids, and it needs to have this sequence repeated at least 2x/molecule to catch and count the molecule in its search for the PPM value. Need specific information about AlerTox Sticks Fish? It is impossible to manufacture a single kit that can recognize all species of fish, or all manufacturing conditions (boiled, in oil, in vinegar, dried etc). Although AlerTox Sticks Fish can recognize between 30-50 types of bony fish, some show a reduced response in certain manufacturing processes. Canned tuna and surimi, or crab stick, are particularly difficult to detect. Please contact us with information about the matrices you are testing. We’ll be able to help determine whether or not the kit will fit your needs. Can I use AlerTox to test rinse water? Yes, rinse water can be tested following the general instructions for testing liquids. Can I use AlerTox to test surfaces? Yes, the directions for testing surfaces is included in the manuals. OleoTest is an easy way to monitor the quality level and lifespan of oil used in deep-fat frying. How is the OleoTest analysis conducted? Feel free to inquire about the expiry dates when you place your order. Store unused tests at room temperature 41ºF (5 ºC) < T < 68ºF (20 ºC), and keep away from light. At the end of the reaction, the mixture solidifies and the completed test can be stored for reference for several months, providing an easy reference for documenting adherence to your food quality control plan. In the event of separation, simply reheat and reshake the oil to bring the results back. The original package can be used to archive completed tests, and should be stored away from light and heat. Oleotest is validated to use with seeds oils (sunflower, corn, peanut, etc.) and coconut oil. A different color scale must be used to measure polar compounds in palm oil. 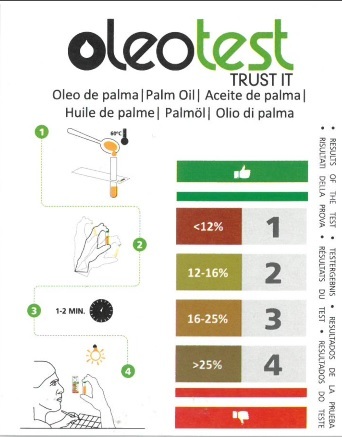 Oleotest can not be used with olive oil as its color interferes with the color of the test. Oils used to fry heavily pigmented foods (such as red peppers) may require a different color chart/scale. Please contact us with questions about adjusting the scale for these other oils. OleoTest is not suitable for testing animal fats. OleoTest measures the percentage of total polar compounds (TPM) present in cooking oil. Cooking oil is a naturally non-polar compound. 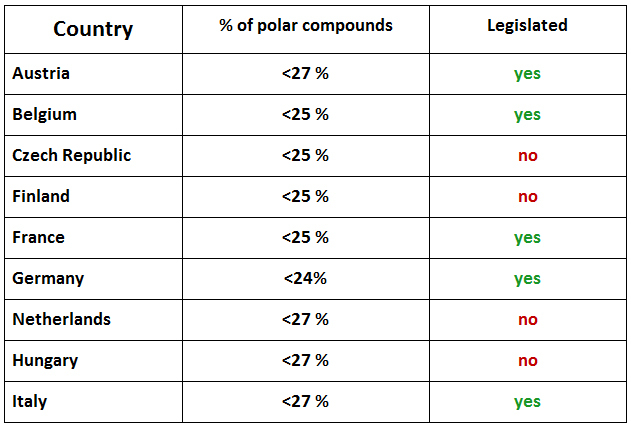 The presence of polar compounds can be attributed to exposure to air, moisture and heat. These undesirable compounds indicate that oil is degrading; high levels negatively affect the health and taste of the fried item. Additional documentation about maintaining healthy oil and adherence to HACCP or any other quality control plans can be found on the product page.